Amazon has a program called Amazon Smile which donates 1/2% of your purchase price to the charity of your choice (which we hope is Fresh Start Furniture Bank). It costs you nothing, but you need to start each of your shopping trips at smile.amazon.com instead of amazon.com. To do this, simply go to smile.amazon.com and log into your Amazon account. 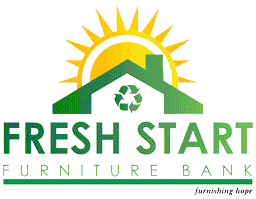 Using this link will automaticall select Fresh Start Furniture as your charity. You should now see "Supporting: Fresh Start Furniture Bank" under the Amazon search box. If you see some other charity, put your cursor on "Supporting...", select "Change Charity" and follow the instructions shown above. From now on remember to use smile.amazon.com when shopping at Amazon and give yourself a pat on the back for helping us!